NAUGATUCK — A local woman driving on Route 63 Sunday night noticed a house on fire and jumped into action. Rachelle Pollock saw plumes of black smoke pouring out of a two-story house at 1192 New Haven Road, Route 63, next door to the Planet Fitness workout facility, just before 6:30 p.m.
“I stopped and heard a young girl screaming that her grandmother couldn’t get out,” Pollock said. Adrenaline took over and Pollock ran toward the house, where the grandmother was trapped near the doorway while flames were in the nearby kitchen. Suddenly, an unidentified man and woman came running from the Planet Fitness parking lot. The unidentified man and another man who lives in the house worked to get the grandmother out of the home safely. There were six people in the house, including at least one child about 4 or 5 years old. Pollock and other passers-by helped to get the family warm inside Pollock’s Jeep Liberty SUV before ambulance crews arrived and began treating at least three people for smoke inhalation. They were taken to hospitals and are expected to be OK, firefighters said. 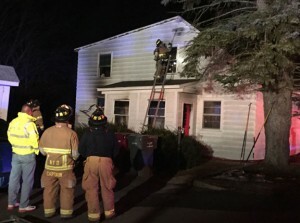 The career Naugatuck Fire Department arrived within minutes and began knocking down flames, which started in the kitchen and appeared to be caused by grease on the stove, firefighters said. The house sustained heavy smoke damage throughout and firefighters shattered a window on the second floor to ventilate the house. The flames were contained to the kitchen. The American Red Cross was on scene to help the family find temporary shelter. Members of the volunteer Beacon Hose Company No. 1 out of Beacon Falls gave mutual aid at the scene. Naugatuck Police and volunteers from Naugatuck Fire Police also responded.